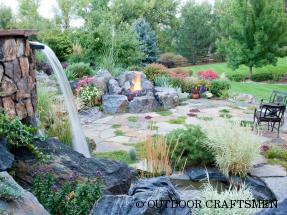 Outdoor Craftsmen works with clients throughout Boulder, Boulder County, and along the Front Range to design and construct the most imaginative, naturally-beautiful, and functional modern landscape designs possible. 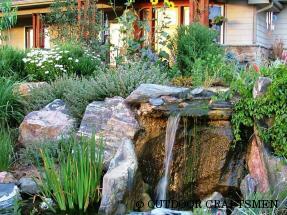 Artistic elements and old world craftsmanship are a reflection of English garden ideals with a Colorado flare. Luxury overflowing with sensory possibilities. Impeccably detailed and elegantly inviting in an immense space where the exterior was expanded far beyond the traditional boundaries. Patios, courtyards, and generous dining and entertaining spaces abound with a serene feel to this magnificent property. 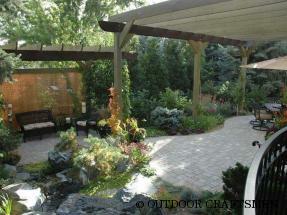 A fully integrated Craftsmen-style landscaped entrance refreshed a dated look. 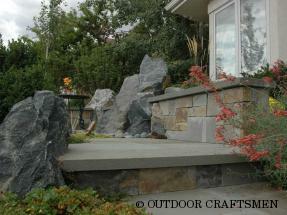 Large boulders, columns, seat walls, and bluestone patio pull the look together. 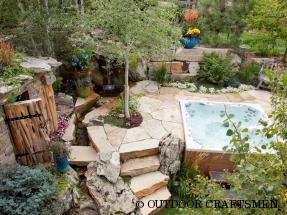 Smaller in scale with welcoming deck and outdoor kitchen and wise use of boulders and water feature. Every Outdoor Craftsmen landscape is personal and expressive, a true reflection of who the homeowner is and what they enjoy. Our unique design-build model forges a partnership with clients that is trusting and encouraging as we work together to realize your modern landscape design dreams. Design-build means our expert professionals work with clients from the early idea-generation phase, through architectural considerations and professional, detailed design plan development, and all the way to installation and construction. The craftsmanship our team offers, coupled with the vision, ideas, dreams, and preferences of our clients, results in some of the most amazing properties in the Boulder, CO, area. Our compilation of modern landscape design case studies is just a starting point as you let yourself explore the possibilities of your home and property. As you browse our portfolio of landscape projects, keep in mind that anything you see in the collections can be an outstanding springboard for a discussion with us about your personal landscape and garden preferences and desires. 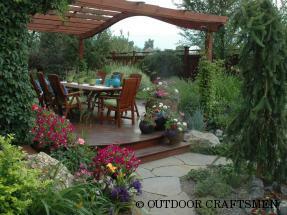 Outdoor Craftsmen brings forward the most experienced, technically-capable team in the Boulder area to work with you as we cultivate your ideas. Our considerable expertise will open up possibilities you may not have considered, including what exterior home renovation will expand the impact of your project and deliver the most value. From modern minimalist and sustainability to natural swimming pools, and industry-leading xeric design principles to sophisticated irrigation, our landscape design projects deliver it all. Embracing the essence of every aspect of the project vision, clients can rest easy that the Outdoor Craftsmen team will design, plan, and implement the necessary details to realize every goal and deliver lasting beauty for the property.